I’ve thought about this idea of annual remembrance quite a bit over the past few months. We have somewhat socially structured ways in which we remember birthdays (cake), anniversaries (dinner) and national holidays (department store sales) but how do we remember traumatic events that take place in our own lifetime? One of the interesting things about studying responses to 9/11 over a period of nearly 10 years is that I’ve been able to observe social processes as they evolve, a process of “culture-building” (a term Allen F. Roberts attributes to Robert Blauner). This process of culture-building reveals itself through physical forms and through acts that can be more difficult to identify as they are often enacted privately. In the days immediately following 9/11 public acts of memory took physical form as spontaneous shrines in parks and fire stations. The largest and most prominent displays were along the 14th Street line, the closest to lower Manhattan one could travel without special identification immediately following the disaster. Shrines incorporated missing person fliers alongside images of the World Trade Center towers as they once stood – visible interaction between an emerging historic narrative of devastation and heroics alongside individual testimonies of lives lost. In the earliest days after 9/11 the tensions between memory and history were already on public display. Reading of the names, Zuccotti Park, NYC, September 11, 2010. I went to the reading of the names this past September and was surprised to find it sparsely attended. Everyone I met was a tourist with the exception of family members participating in the ceremony. Only a handful stayed for the entire event. Maybe it’s because it was a Saturday and it was chilly in the shade, but I think there was more to it than that. I’ve asked this question – how do you remember – to quite a few people, and was surprised to find that despite the many, many commemorative events one can participate in around the anniversary of 9/11, a lot of people who were directly affected prefer a more private remembrance. A good friend told me that members of her synagogue in New Jersey spontaneously emailed their 9/11 stories to the congregation’s listserv this year. Several people told me that until we spoke they had not realized that each year around mid-September they often feel the need to call the people they were with on that day. 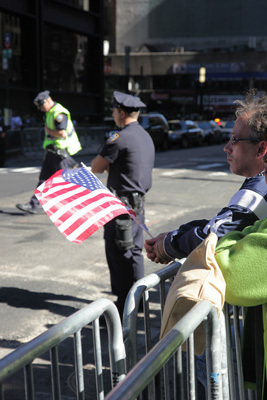 Many New York residents expressed a desire to be away from NYC on the anniversary. 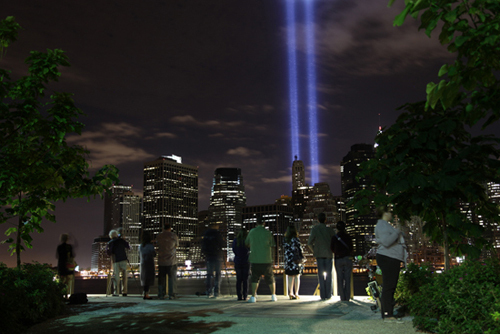 Others enjoyed seeing the Tribute in Light as a quiet reminder of the day’s significance. One surprise was that many people prefer to watch the annual reading of the names on television in their private homes rather than on a downtown street corner, a practice that reminds me of my father-in-law’s love of college football. It’s great at the Coliseum, but you always have a better view on TV. Do you do anything special to remember 9/11? How do you remember? You are currently reading How do you remember? at After 9/11.